100 Classic Stories is edited by Vic Parker and illustrated by I don't know who. All of the images are credited as being from the Miles Kelly Archives. I would call them whimsical. Cute. Fairy-tale-ish. The stories are divided up by age. The first section is for ages 4-6, the second for ages 7-9. I would say on average the book is perfect for ages 5-6. (Hey, how's that average! Whatever.) It's a nice book for 33 year olds as well, if you were wondering. Each story is somewhere between 2-4 pages long and there are illustrations on each page which help keep the younger reader engaged. 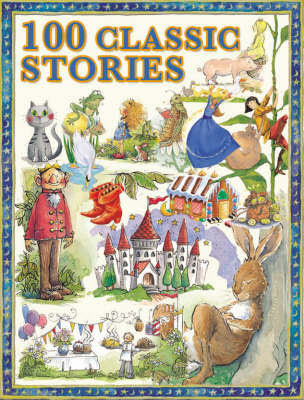 There are fairy tales, stories from around the world, myths and legends and animal-themed stories as well. I dislike scary stories for children and there are some I probably will hold off reading just yet to my four-but-almost-five year old. That said, none of the illustrations are particularly offensive to the point where I mind handing the entire book over for him to browse through. (There is even a Minotaur in one! Woot! Score!) I crawled back in the car with the book and handed it to my son, telling him there were one hundred stories in this book and his eyes got really wide and he lunged for it. (Truly, he did! He is, after all, my son.) When we finally had an opportunity over the past weekend to sit down and read it, he asked to read story after story after story! There are, after all, so many to choose from. I've found it rather difficult to find classic stories as individual paperback books. When I have found them, they've been located at used bookstores and are usually in old books section. Unless a classic is revised (take for example The Twelve Dancing Princess which I reviewed recently) then I've feared I would have to wait longer to introduce classic stories to my kids, as most compilations are not kid-friendly, with illustrations included.) At the very least, this has been my experience. So I was and am quite delighted with 100 Classic Stories . I've linked to to Amazon although it is apparently out-of-print. If you have a Barnes & Noble near you, check there. If not, poke around. I think it's worth finding a copy to share some of these treasures with our kids, in all of their fierce beauty . . . trolls, enchantments and all! Sounds like a fun book! I love the classic stories. 100 stories sounds like a million to a little kid. Too cute!